Jumpstart a new project or show an alternative option using project duplication. You have an existing project that is similar in design to a new opportunity that you are going to start working on. It would save a lot of time to duplicate the previous project and change certain data for the new customer. You have an existing project and you want to explore alternative solutions, or show different options with different quotes. You can duplicate a project from the project settings window. To open the settings window for a project, click on the gear icon in the top navigation within a project or in the projects dashboard. 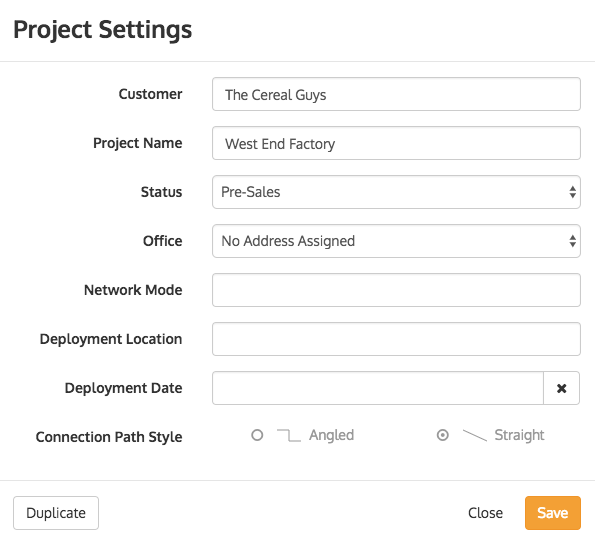 Once you are looking at the project settings, you can click 'Duplicate' in the bottom left to duplicate the project. After clicking Duplicate, the settings window will close and you will see a progress bar in the bottom right. Finally, once that completes, the progress bar will turn into a notification that the project has been duplicated. You can click the notification to open the new project you just created. TIP Before you hit the duplicate button, you can change any of the settings in the settings window. These changes will not be saved to the original project, but will be used as the settings for the new project. If you find yourself using project duplication a lot to jumpstart similar designs you should consider using Icon Bundles to save a generic design in your icon library. Then you can drag out that Icon Bundle into any project, even existing ones to save yourself a lot of time and effort. Using Icon Bundles gives you additional benefits too, such as being able to share it with everyone in your company and not having to worry about forgetting to change some customer specific data in the new project.